You’re sitting on the back row trying to silence your child. You’ve done everything you can think of to appease them, and they’re still being too loud. You get up and take them out of the sanctuary again. Your face is flush with embarrassment and there are tears welling in your eyes. As you walk, you wonder what is the point of even coming to church? It takes a Herculean effort just to get to church with your kid(s), and then you only hear every seventh word the preacher says, and your child is certainly distracting the people around you. 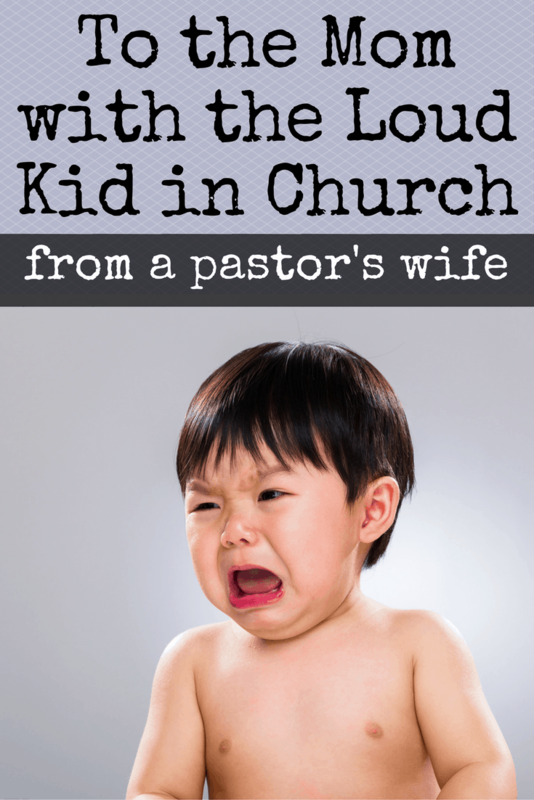 Here are three reasons why being in church with your rowdy kid is the best thing you can do. Your family culture is being established in the routine you are creating today. You’re not going to wait until they’re older to establish good eating habits or sleep habits. You aren’t going to wait until their adult teeth grow in before you start brushing, so why would you wait to establish good spiritual habits? If going to church is part of your family routine, you will have a much easier time dragging your teenager out of bed than if you decide to start going to church when they’re teenagers. At that point, you will feel like only Jesus can help you deal with that attitude they’ve developed. This post, To the Mom with the Loud Kid in Church from a Pastor’s Wife, contains some affiliate links for your convenience. This means if you make a purchase after clicking a link, I will earn a small commission at no additional cost to you. Read my full disclosure policy. And honestly, every kid I know loves church. People that are willingly get up early to teach kids about Jesus on one of their two days off are awesome. They have a genuine love for kids and Jesus, and kids love to be around that kind of energy. And I know the struggle to get to church is real. I have four kids to get ready. While my husband is awesome and helpful six mornings a week, Sunday is not one of them. On Sundays, he goes into some sort of preacher zone and just prays and goes through his sermon for two hours while he gets himself ready. Apparently, that’s a pretty common thing among pastors burdened with the spiritual guidance of their congregation, so I try to not hold it against him. And for this season of life, I’m totally okay with it. Getting to church on time isn’t nearly as important as getting to church in the right frame of mind. If I spend the whole morning nagging and yelling so that we can be at church on time to learn about Jesus, but I’ve missed a perfect opportunity to act like Jesus, then it’s sort of pointless. I want to be like Jesus, and I can’t remember a single time that Jesus preached about the importance of being on time. In fact, people criticized Jesus for being late. Like when he was supposed to heal his sick friend Lazarus. He got there so late that Lazarus had already died. But He was Jesus, so He just brought Lazarus back to life. You can read more about this awesome story in John 11:38-44. And while it is important to be at church to get the full lesson and all that jazz, it’s not worth ruining the morning to be there on time. So wake up early enough to give your family plenty of time, but if you’re running late, chill. Sunday school will start without y’all and your kids will just jump right in when they get there. This season won’t last forever. Someday your kids will get dressed all by themselves and it won’t be a two-hour ordeal to get out of the house. So let’s use this time when are they are like little sponges to establish the habit of going to church because we love learning about Jesus so that we can be more like Him. Hopefully, by the time they can put their own pants on, they’ll wake up excited to get to church because that’s what we’ve modeled for them. The church isn’t a building that we go to worship God. The church is the people we meet with to worship God together. It isn’t the hour we spend in the sanctuary singing and listening. So while it is great to have a great preacher, awesome worship services, and cool kid’s programs, it’s more important to have a supportive group of believers that are your church family. They’ll be the people that you call when you get a cancer diagnosis, your marriage is falling apart, your teenager is out of control, or you are just completely broken. They’re your people because your relationship is built on the solid ground of love for and from God. Some of the best relationships that I have made have been forged in hallways, foyers, and cry rooms while trying to calm down kids. I have met other moms struggling with the same things. I have had grandmas come out of the service to lend a hand, and I have lent a hand to other moms. That’s what community is about. We bear each other’s burdens. Sometimes our burdens are kids. So even if you have to take your kids out of service for half the message, go to church. Go to Sunday school or small group or life group or whatever your church calls it. They’re just like you – sinners saved by grace. They may have been in church longer and know more of the right answers to the questions in the lesson, but they’re still broken people in a broken world. Look for ways to interact with people besides just sitting in pews near each other. Plan a game night, pot luck, cookout, group service project, or some other event and get to know people. It’s hard and intimidating, but it’s so worth it. If you’re an introvert, check out our post about how to be hospitable even when you’re an introverted homebody. You’re doing a hard hard thing. If you’d like to feel better about your child’s behavior, you should read about the time I carried my four-year-old son out of a church service kicking and screaming. But it’s setting an example for our kids. They will remember that you got up super early on one of your days off to make sure that they had a good morning before going to church. Although they may not realize that it was a sacrifice until they’re doing it with their own kids! If you can raise your kids in such a way that going to church is a normal part of life, then you’ve done well. The side effects of church life are so numerous and awesome that it’s worth the sacrifice. Your kid’s friends are going to be from your church. So even if they do make some bad decisions, you know that they are getting good instruction. You’ll already know their friend’s parents from church. It’s hard to let your kids out of your sight without worrying. That won’t be such a concern when you already know their friend’s parents from church. They will be constantly going to a place with adults that love them. So even if they are the ADHD “problem kid” at school, they’ll just be the “energetic kid” at church. They’ll be loved and built up by the adults around them. Kids are like sponges and so they’ll be absorbing good things in those foundational years that will come back to help them when they are older. You’re influencing the way your grandkids will be raised. I’ve seen too many people lamenting the fact that their grandkids don’t go to church, but they didn’t ever make church a priority when their children were at home. They missed church all the time for ball games and slumber parties, thus teaching that church attendance was secondary to other activities. I’m not saying to quit extracurriculars or to never miss church. I am saying to be deliberate about your parenting choices. I know it’s hard and most of the people around you know that it’s hard. Yeah, there are a couple of people that may give you the stink eye, but most of the people in church are good people who aren’t judging you at all. I know that every time I see a mom walk out with a kid, I say a quick prayer for them. Keep getting up and getting kids dressed and bringing them to church. It doesn’t matter how late you are or if their shoes match. It matters that you’re there with kids who know you love them because you’ve shown them that morning. 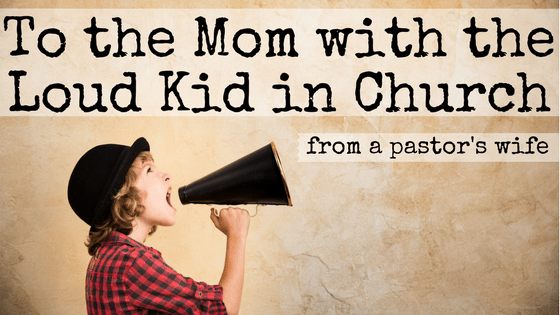 What message would you send to the mom leaving church with a rowdy kid? Tell us in the comments! Oh this made me cry. I’ve had so many of the ‘why bother’ thoughts when my four year old is having a melt down because I won’t let him throw paper airplanes during church. I NEEDED these words so so much. I’m so glad this helped you! It is so hard to train kids to act right in church. But it is also so worth it. Keep going and working with him. With Dax, there was one day it sort of clicked and we only had a couple of incidences after that. Pinned on parenting board. Love love love this encouragement!! I’m the one with the loud kid. I’m blessed to be a part of a church that loves has this same loving atmosphere. Thank you for this post! I run a blog over at titus2toyou.com and I wrote on a very similar topic after going through several struggles with my children in church. Moms need encouragement to push through those tough years when you’d rather give up on Sunday mass!